Philadelphia Eagles quarterback Carson Wentz (11) reacts after being sacked by Minnesota Vikings defensive tackle Linval Joseph (98) during the first quarter at Lincoln Financial Field. 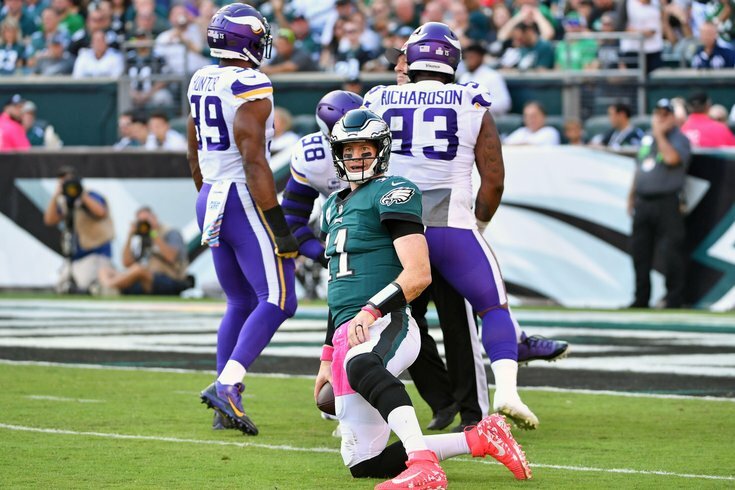 If Eagles fans were expecting a repeat of last winter's demolition of the Minnesota Vikings, they got a wake-up call in the first half on Sunday. The Eagles continued to struggle on the offensive side of the ball, and they head into the tunnel trailing the visitors 17-3. Here's what I saw in yet another sloppy half of football. • The Vikings have been much more prolific at moving the ball between the 20's than they've been at actually putting points on the board. That trend continued early against the Eagles, who buckled down in the red zone after Minnesota dinked and dunked their way down the field on their first possession. Brandon Graham was particularly active early on despite not actually getting to the quarterback. He blew up Minnesota's O-line to force Cousins into a tough throw early in the drive, and came up with the series ending knockdown to end the touchdown threat deep in Eagles territory. Graham finally struck gold to close the first quarter, earning his first sack of the season after several close calls. This group needs to start coming up with more sacks at some point, but a good start for Graham at the very least. • Jalen Mills came up with a nice third-down breakup deep in Eagles territory, and he didn't even offer a finger wag afterward. Is he turning over a new leaf? • Shelton Gibson finally got a chance to make his presence felt against the Vikings, and a play he made early in the second quarter helped breathe life into a unit that desperately needed a spark. Perhaps he should be getting more reps than Kamar Aiken, who has offered the Eagles almost nothing this year. • Philadelphia's secondary has been an issue all season, though they did a reasonably good job through the first two quarters of play at managing Minnesota's strengths and weaknesses. Kirk Cousins wants to throw quick passes and get the ball out of his hands, and you're not always going to be able to do a whole lot at preventing completions when a team plays that way. You can try to jump routes, sure, but that comes at the cost of potentially biting on double moves and giving up big plays. The Eagles were happy to let the Vikings play that style of football, and when the Vikings had to actually turn to slower-developing plays to pick up bigger chunks of yardage, the secondary gave the defensive line enough time to pressure Cousins and force him into bad throws. That's more than you can say about their work most weeks, and so far the defense's home excellence is holding. They'll need it to with the state of the offense right now. • It was not the most blinding half of football for Carson Wentz, but most of those problems don't fall on his shoulders. He was accurate with time to step up and throw, looked and attacked down the field, and was let down by both his teammates and playcalling on several critical third downs. There's not a whole lot more to say about his half, because he really didn't do enough to analyze it in depth. • Isaac Seumalo was given the opportunity to start against the Vikings, and the early returns were only slightly better than putting a cardboard cutout at guard and hoping the other team didn't knock it over. On two of the first three plays from scrimmage for the Eagles, Seumalo got absolutely bullied, with Carson Wentz taking a hit as a result of the first one and a sack for a big loss as a product of the second. The new starter offered almost no resistance, and Philadelphia's offense did not look one iota better following the change up front. Line play has been surprisingly poor so far this year, and it only seemed to get worse with Seumalo in the game. Are we absolutely sure Stefen Wisniewski shouldn't continue to get the reps there? • I'm not certain when we need to start having a real conversation about the impact of play-calling this season, but Doug Pederson continues to make some real head-scratching decisions on offense. After a Wendell Smallwood carry put the Eagles inches away from a first down midway through the first quarter, Pederson decided the best course of action was to throw a pitch to Josh Adams. The play was predictably stopped for a loss, and the Eagles were forced to punt. I appreciate Pederson's forward-thinking approach as it pertains to fourth-down calls, and it's clear the Eagles were trying to use some misdirection to bust off a big gain. But why Adams if that's the play you want to run? If you want to go that route, use the personnel that's better suited to run the play. It doesn't take a football genius to point out the problem here. With Philadelphia's offense continuing to sputter, why get overly cute? Pick up the third and inches with a simple approach — a run up the middle, a QB sneak — and let your guys build some momentum. This team has had very little rhythm, and blame for that belongs partially with the head coach. • Negative four yards on offense for an entire quarter is, well, pretty damn bad. • In the same vein as the Adams complaint, the Eagles actually drew up a fine play on third and three inside the Vikings' 20. But the play was a designed short throw for Smallwood, who does not exactly have the most reliable set of hands on the team. Personnel selections can make or break even the best-designed plays. The Eagles obviously could use Darren Sproles in these situations, but that's no excuse to hamstring yourself otherwise. • Lane Johnson's regression this year has been one of the biggest reasons the offensive line as a whole has looked worse. The right tackle has transformed from an elite player at his position to an inconsistent mess in the span of about eight months, and he was the guilty party on the forced fumble that produced Minnesota's first touchdown of the game. That's two weeks in a row that Johnson has allowed a pressure on his side that led to a strip sack for their opponent. I don't know what the explanation is, but if they can't even count on Johnson for above-average play, the Eagles are in major trouble. • Technically not related to this game, but did we really need to cut away from a game-winning attempt for the Panthers in order to show a series of worthless commercials leading into the Eagles game? For shame, Fox. • This Eagles performance sure has been ugly, am I right folks? • That roughing the passer call on Michael Bennett to close out the half is one of the most ridiculous penalties I've seen called in a football game. It turned a sack and a big loss of yardage into a red-zone opportunity for the Vikings. Absolute garbage. • No seriously, let's use a second bullet point for this: that Bennett penalty was atrocious, and the officials should feel bad. Why bother watching this nonsense?